Cheshire Granite Worktops are a well established fabricator, with a growing reputation in the Cheshire area. 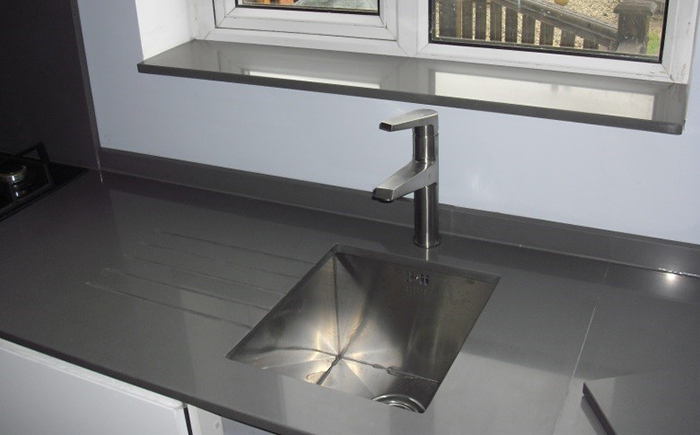 With the factory located centrally in Knutsford, we have templated and fitted quartz and granite worktops for many customers in and around Manchester. Read below a selection of reviews from our delighted customer in and around Manchester. You can also read more customer reviews in our Testimonials section. Requirements: Replacement worktops with 30mm River White granite, and 100mm upstands, 2 x polished sink cutouts, hob cutout, drainer grooves and tap hole. The replacement of our granite worktops was done without any problems. Both the organising and the actual fitting went very smoothly including the visit to select the granite pieces. Exceptional service and a good recommendation. Requirements: 20mm worktops, hob splash back and 50mm upstands. Polished sink cut-out, drainer grooves, tap hole and hob cutout. “Cheshire Granite provided us with the perfect solution to our kitchen top dilemma! Fantastic service from Donna and Darren, providing us with great choices from a range of high quality stone and very good sound advice during the whole process. We now have the kitchen we dreamed of and the work top is definitely the finishing touch to it all! I highly recommend Cheshire Granite to anyone buying a new kitchen, explore their range and see what they can do for you.